Materials: 21K yellow feathers and red gold wire wrapping. 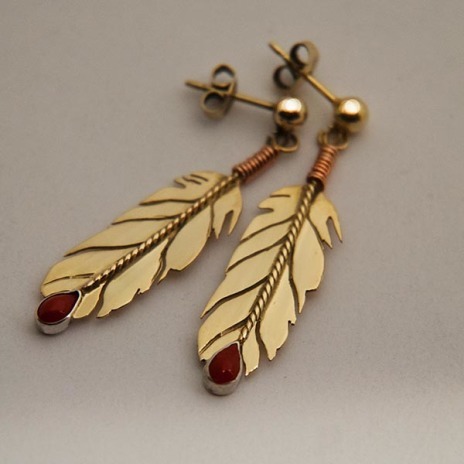 Tips of eagle feathers are mounted with pear-shaped red coral cabochons set in sterling silver. Detail: The earrings come with a matching collar necklace and pendant. The Ojibwe Anishinaabeg from the North American Great Lakes traditionally regard MIGIZI, the bald eagle as the most prominent member of the Winged Beings as his wing tips seem to touch the sun. In doing so, this mighty white-headed spirit bird draws man's attention to Gimishoomisinaan Giizis, Our Sun Grandfather, and, through him, to GICHI-MANIDOO, the Great Mystery and Creator of the Universe.